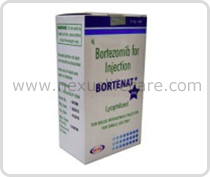 Bortezomib Injection distributors, dealers & suppliers in Mumbai. Uses:- Bortezomib Injection interferes with the growth of some cancer cells and keeps them from spreading in your body. Bortezomib Injection is used to treat multiple myeloma and mantle cell lymphoma.